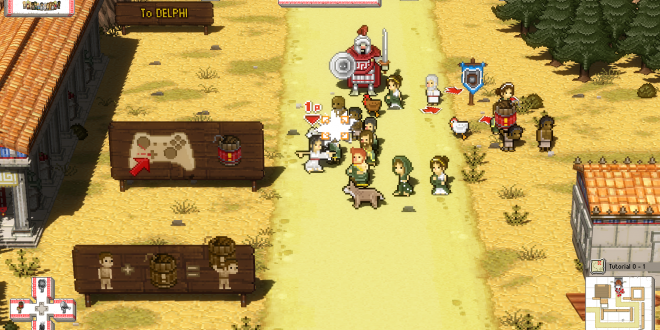 Today’s Greenlight spotlight is on Okhlos, a unique take on the action-roguelike genre. 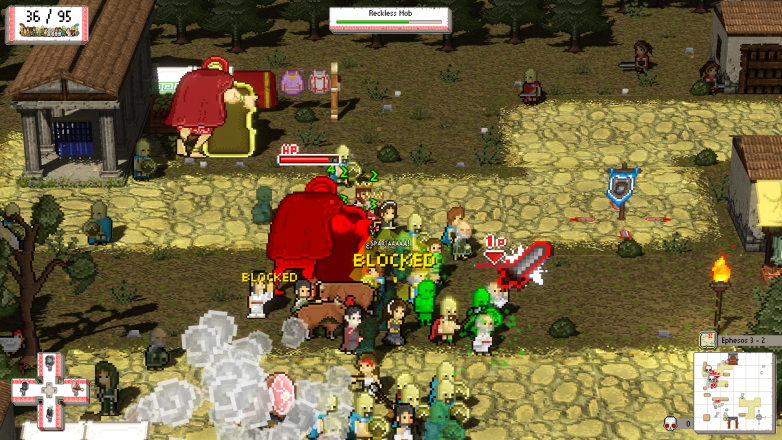 In Okhlos, you take control of an angry mob of ancient Greek citizens. First of all, it is most likely pretty obvious as to why this game was chosen for the spotlight. Controlling an entire angry mob? Come on, that sounds like one of the most intense and hilarious gameplay experiences that I could possibly imagine. These angry Greeks are set on overthrowing the Gods of Olympus, and are prepared to destroy anything that lies in their way. Okhlos features a very well-done pixel art style along with fully interactive 3D environments. All of the cities in the game are generated procedurally, meaning that you will always have a new city to destroy with your group of angry men and women. You can recruit hundreds of unique characters into your mob, so you wont have to worry about seeing the same person fifty times throughout your cloud of destruction. In terms of its roguelike vibe, Okhlos provides the player with new heroes, monsters, and bosses in each playthrough which means that you will never have the exact same experience twice. Procedural generation mixed with randomized heroes and enemies combine to create a game that is brimming with content. Consisting of eight different worlds, Okhlos bases each one on a different mythological scenario. The game boasts that you will never have to play the same level more than once. Each person that you decide to grab and insert into your angry mob is completely different, and you can combine different units with different abilities to create the ultimate angry mob of decimation. Control your mob and lead them to battle against twelve Gods as you attempt to overthrow them, and face tons of mythological creatures along the way who are looking to cause damage to your mob. Finally, the game’s fast-paced combat system requires both skill and precision in order to be effective, and will provide players with a challenge on each playthrough. Okhlos definitely seems like a game that provides a lot of content, which is always something that smart consumers are looking for. If you’re interested in the game, you can check out more information on their official site, where you can leave a contribution and even gain access to the closed beta which will be launching in the near future. For those who’d rather wait and see, be sure to leave a vote and some constructive feedback on their Greenlight page. Next Project CARS: Will This put Forza on the Ropes?